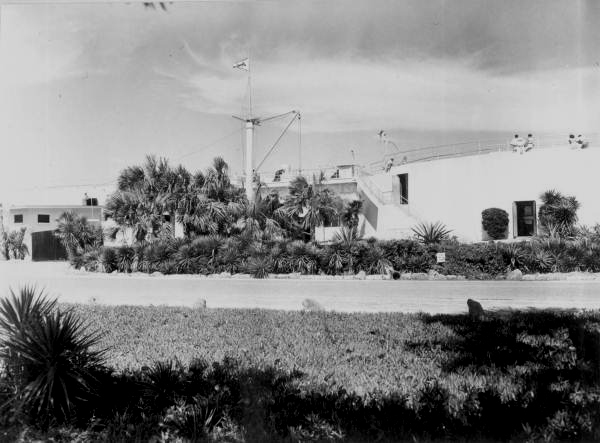 Marine Studios, later known as Marineland of Florida, opened in 1938 and was billed as the world’s first “oceanarium”. It is located on the Atlantic Ocean at the south end of St. Johns County. The road you see here is part of scenic A1A. The circular structure on the right was the dolphin tank. You could watch the dolphins from the top or from two levels of portholes surrounding the sides of the tank. You can see one through the door on the bottom right. To the left of the mast is the rectangular tank that showcased an assortment of sea creatures ranging from sharks to sea turtles to grouper. These buildings are gone now. A modern facility offering dolphin adventures has taken its place. The facility was recently purchased by the Georgia Aquarium. If you would like to learn more, Images of America’s Marineland is available in both print and Kindle editions.